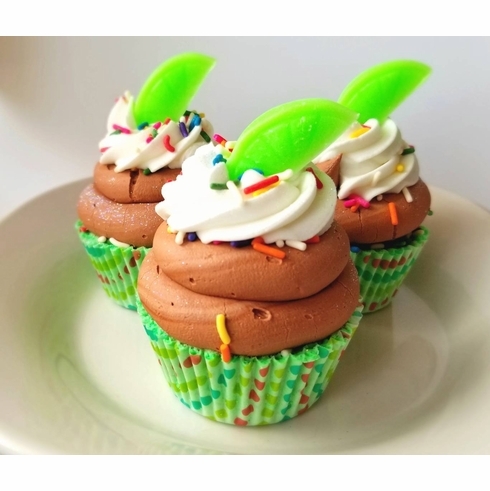 Treat yourself to this yummy bath treat. Almost good enough to eat. Bath bomb is frosted with brown and white icing, sprinkles, glitter, and a soap lime. Bath bomb weighs approximately 7 oz. It comes in a cute cello bag tied with a ribbon and is ready for your gift-giving. Ingredients: baking soda, citric acid, powdered sugar, Epson salt, sunflower oil, coconut oil, mango butter, meringue, cream of tartar, colorant, fragrance, glitter, sprinkles, soap. These bath bombs contain no SLS (a synthetic detergent) and will not bubble, only fizz. Also, any pipping that is on the bath bombs is made with royal icing (powdered sugar, meringue, cream of tartar, water, skin-safe colorant). In addition, some of these contain colorants that may color the water and may stain the tub. To lessen this effect, clean the tub before and immediately after using the bath bomb. Remember, these contain oils and/or butters and will be released into the tub water. Tub may become slippery.